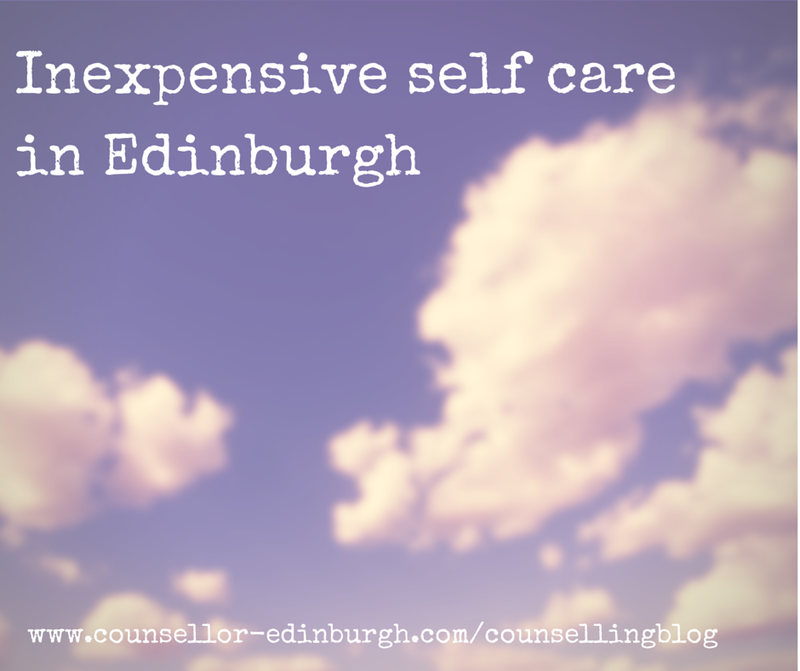 I wanted to simply share a few ideas of things you can do in the Edinburgh area to give yourself a bit of space, a bit of peace. Of course it totally depends on what you’re into, but if you are sensitive, you might be craving some time out. I encourage clients during our counselling sessions to find ways to value who they are, and often self care can be part of that. I find that setting aside time for myself helps me to feel more grounded, feel valued when I’m finding it a struggle to value myself and gives me the space to reflect. Could you include a few minutes, an hour, a day doing something that you need right now? It can help. Before you fall into doing something: think, is this really what you want to do right now? If you’re going to do something good for yourself, own up to it, and celebrate that time. For example, rather than almost sneakily watching that box set, celebrate that time alone: make some popcorn, get a take away, bring the duvet with you; whatever you can do to make a mini event of it. It’s about treating yourself as you would a treasured friend. So here are a few ideas to get you started. Allow yourself to lie on the floor, and listen to the sounds around, observe your breathing, notice the sensation of the floor taking your weight. Spend about 3 or so minutes here. Take 30 minutes out to create something to express how you are feeling just now. Take a flask of tea or coffee and climb to the top of a favourite hill, be it Arthur’s Seat, Carlton Hill or Blackford Hill. Drink in the view and keep yourself toasty with your hot drink. Sit beneath a tree in the meadows or your favourite park, if the weather suits. For these chilly months buy or bring a hot drink. My favourite is a cardamom hot chocolate from Peter’s Yard on a bench in the Meadows on a chilly day. On a rainy day there are some beautiful spaces to simply be in, perhaps take your sketch book or write something about how you are. Good spaces I have found are: the atrium in the National Museum of Scotland (big, grand space), the open spaces in the Portrait Gallery (there are seats and space and art) or perhaps the big airy space of a cathedral (if religious spaces feel ok or helpful for you). Spend time in front of two pieces of art from any of the vast collections and galleries in Edinburgh. Portobello Turkish Baths – are a treat (if you like being very hot, followed by very cold) for your body. An inexpensive spa day. I do understand that there can be times where to decide to care for yourself can feel too hard; but it may help, even just a little. You are worth the effort, you really are. I’d love to hear what you do as self care. Please post your ideas below, and feel free to share this post with others who may find it useful. How lovely. So often it feels selfish to do things for ourselves, but I have learnt very necessary for my mental health. I think you’re so right Allie. ‘This is not a film star’; they’re right – this is a *NATURAL* beauty, a woman who makes all the Plastics look even more ridiculous than they already did. I applaud Kate Blanchett, I really do – my admiration for her has risen considerably.